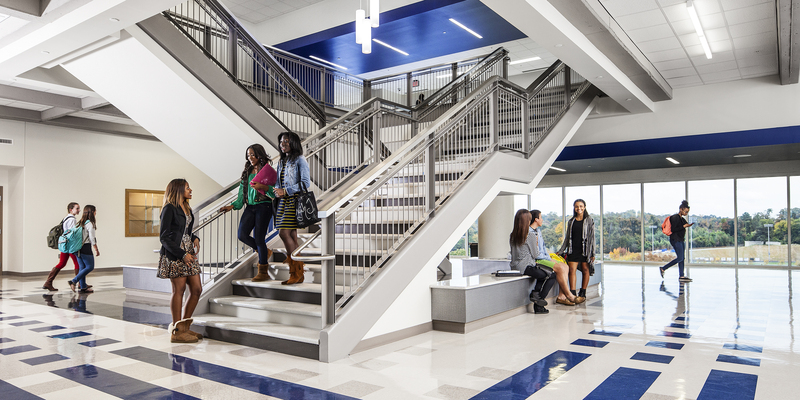 The new North Atlanta High School is designed to accommodate 2,350 students in what previously had been a 56-acre IBM Corporate Campus. The adaptive re-use design includes an 11-story concrete-framed office tower that spans over a scenic lake, an assembly building and a 942-car parking deck. In order to maintain the site’s beautiful, dramatic terrain, the existing, on-grade parking lots were converted into athletic venues for baseball, softball, football, tennis and track. The functional space needs of a high school are quite different from those of a corporate campus; however, the existing office tower was well suited to provide primary classroom, administration and food service space. The top eight-floors contain four small learning communities that are each housed on two floors. Each learning community was designed with a large double-level public space that includes a dramatic, connecting staircase. These focal spaces create a place for students to connect, hang out and identify as their own space. In addition, from a student’s perspective, each of these learning communities breakdown the size of the school into a space that each student can connect with.The project presented a particular challenge of efficiently moving 2,350 students throughout the 11-story tower and ensuring that students arrived to class on time. Cooper Carry devised a floor access system where staff and those with disabilities have access to every floor while students are only granted elevator access to the top floor of each academy and other public floors. As a result, students are encouraged to use the stairs in their own community, minimizing the number of elevator stops. A third set of stairs was added to the center of the tower for safety and convenience. Drawing on Cooper Carry’s experience designing high-rise hotels and office buildings, the design team replaced the traditional, outdated elevators with state-of-the-art destination elevators found in newer high-rise hotels and offices. This high tech system directs users to specific elevator cars, transporting them to the same floors and thus reducing the load time in half.An additional assembly building constructed adjacent to the tower includes large, high-volume spaces with special acoustic needs and accommodates a 600-seat auditorium, a 150-seat black box theater, music rooms and a 2,100-seat competition gymnasium with practice gym. A ‘Main Street’ design approach was used to connect the two main buildings and parking facility. Cooper Carry provided Architecture, Landscape Architecture, Interior Design and Graphic Design Services with Collins Cooper Carusi Architects, Inc. & Paul Cheeks Architects, LLC.